This courgette (or zucchini if you’re in America) and sweetcorn soup is quite a new discovery. It’s so easy but so good. I was planning on making a courgette, potato and sweetcorn chowder a few weeks ago but when I got the potatoes out they were well past their best and this is what I ended up making instead. It’s a very simple recipe so I was pleasantly surprised by how nice it was and I’ve just made it again for my lunch and it was as good as I remembered. 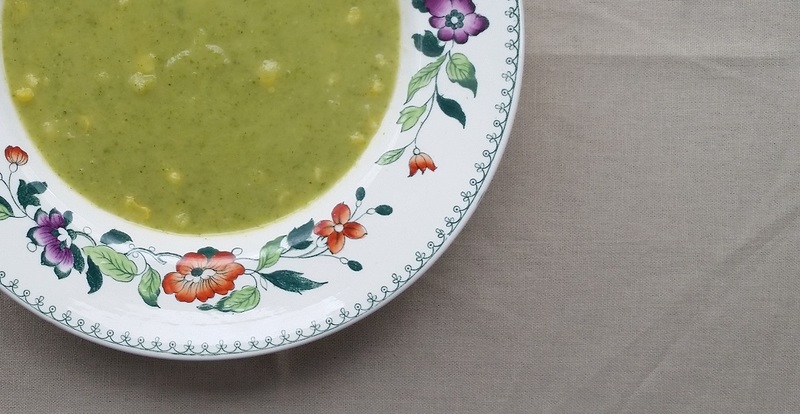 If you’re unconvinced by the idea of a courgette-based soup, give it a try. I was introduced to it by my friend Tara and the first time I had it I was amazed by how much flavour and body it has (I think of courgettes as being quite a watery vegetable). The addition of sweetcorn makes it even more substantial but you could skip the sweetcorn if you don’t like it or you want something lighter. People who grow their own veg often find themselves with too many courgettes at the end of the summer so this would be a useful recipe then. 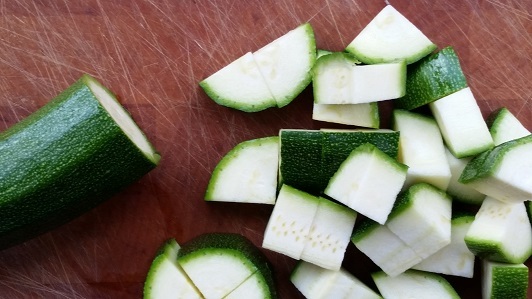 Cut the courgettes into slices about 1 cm thick and then quarter them. Add the onion, garlic and courgettes, stir well and cook gently for about 10 minutes with the lid on, stirring occasionally. Add the vegetable stock and simmer for a further 10 minutes. Allow to cool a bit and then blend until smooth. If you want it thinner, you can add some extra water at this point. Add the sweetcorn and reheat gently making sure that the sweetcorn and the soup are both hot. I like this soup just as it is but you might want to season it with salt and black pepper.